More engaged students – Students are often more engaged when material is presented with digital tools. Technologies actively engage the students through problem-solving games, quicker study methods, and unlimited potential for research. 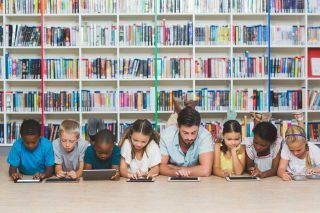 Increased motivation and better-developed collaboration skills – Those teachers in our districts who are utilizing technology have reported that using digital tools in instruction has increased a sense of teamwork and collaboration within the class. Simplified materials – Too often backpacks weigh almost 15 percent of a student’s body weight. Technology can put a wealth of material literally into the palm of a student’s hand. Lightweight new laptops and digital books can easily take the place of heavy, cumbersome books and notebooks. Finding the right tools to support all learners can empower a student in ways we may never have thought possible. A simple text-to-speech tool, Voice Typing in Google Docs or the Chrome. You can access Voice Typing by selecting “tools” then voice typing is an option. The extension SpeakIt, can open a student’s world and allow them to share their voice/thoughts in ways they could not before. The website Rewordify can take complex text and simplify it to reduce frustration while increasing comprehension. Helping kids attend the same text as their peers prevents them from feeling different. Read and Write for Google, a Chrome Extension, is a powerful tool with multiple abilities to support every learner. This amazing tool lets the student annotate text, build their vocabulary, create an audio recording of their text, provides speech-to-text/text-to-speech capabilities and so much more. Critical thinking skills allows students to work on comparing and contrasting content. Our educators are using Newsela’s categories of readings to find articles that lend themselves to comparisons or even the pro/con option in text set. Teachers can assign two or more articles to the class or specific students to read. Then, empower students to find similarities and differences between the articles and record their thinking or key features of each article. Students can even use annotations to make notes in the readings. Finally, students can record results many ways including a Venn diagram to share their thinking and conclusions. Newsela also allows for differentiation, providing the same news article on different Lexile levels to meet the needs of all the learners. A KWL chart is an instructional reading strategy that is used to guide students through a text. Students begin by brainstorming everything they Know about a topic. This information is recorded in the K column of the chart. Students then generate a list of questions about what they Want to Know about the topic. These questions are listed in the W column. After the lesson students record what they Learned and that is recorded in the L column of the K-W-L chart. Insert technology tools such as Buncee or Google Slides to enhance collaboration and a digital experience. Each slide could include a few sentences, images, maybe a video, and a voice overlay. Then, play the Buncee on auto-advance to read it like a storybook or use GSlides in presentation mode. Throughout a unit, students can review their K-W-L charts by adding to column and being creative or even for peer review work. Technology not only increases engagement of student users but it is also necessary to be used to help students find their voice. Tools like Flipgrid give students a chance to reflect upon their learning while also offering feedback to their peers. Reflection and feedback enhances the learning process taking their learning and understanding to a deeper more meaningful level. Students can use Flipgrid to explain how they solved a problem, share thoughts on a book they read, provide a different ending to a story, the possibilities are endless. Using a tool like Google My Maps can allow students to map out a novel or historical events. The students can use the maps to retell a story including text, images and even videos while connecting it back to a place on a map. Visual mapping can boost a student’s understanding of a topic. A student may not understand where a place is or how it looks unless provided with a visual aid. Visuals, such as Google My Maps, inspires creativity and deeper thinking. Global connections are key to building empathy and social awareness for students beyond their classroom. Using Skype Classroom and Google Hangouts, teachers can open the world to their students. Accessing these tools will provide opportunities for connections beyond the classroom. Using social media such as Twitter can help the teacher make connections with educators in other parts of the world. Technology gives our students a dynamic opportunity to make their thinking patterns visible. Curriculum is the foundation for planning and learning for students. Marrying both will allow students to apply their knowledge in published works, and have significant impact on student engagement, critical thinking, and collaborative learning. Dr. Matthew X. Joseph (@MatthewXJoseph) is currently Director of Digital Learning and Innovation for Milford Public School, Milford, Ma. Before Tech and Learning Boston 2018, he had the opportunity to present at #TLTechLive in Boston and New Jersey in 2017 and other state opportunities focused on Ed Tech Leadership and empowering teachers. Before Milford, he was a building principal for 11 years in Massachusetts. Other professional roles include: classroom teacher, PD specialist, and other district roles supporting technology instruction. Dr. Joseph holds licenses in general education, school administration, and MA superintendent. His master's degree is in SPED and he holds an Ed.D. in Educational Leadership from Boston College. Colleen Terrill (@cterrillteach) is currently the Director of Instructional Technology for Mashpee Public Schools after being a 6th grade teacher for 15 years. She provides ongoing professional development for teachers in her district where she focuses on the importance of balance between technology and curriculum. Colleen is a regular presenter at regional and national conferences such as MassCUE, ACTEM, Christa McAuliffe Technology Conference, CoSN and ISTE. She was a Keynote Panel Presenter for the New England 1:1 Summit. She is also an Associate Professor through the Extended Campus Program at Fitchburg State University where she teaches Explicit Instruction as well as Technology Integration in the Classroom. She is currently pursuing her Certificate of Advanced Graduate Studies in Educational Leadership from Curry College.